Another well crafted letter that confirms ONLY that PHSO don’t read the full history of a complaint but instead look for any easy way out supporting the very organization they were setup to monitor. It is evident that Huntercombe Group were engaged to provide information to your employers about your fitness to work and the legislation that governs our work does not allow us to investigate such complaints. Quite simply, we do not have jurisdiction over the actions of Huntercombe Group in this capacity. So that’s the ICO, GMC, CQC and PHSO who don’t have jurisdiction. So we have Data Protection Laws that no one enforces making the DPA a total joke. You reiterate that you did not give permission for your information to be shared. However, it is evident from the papers that you did provide written consent to your manager in an email dated 23 July 2012 It seems this email confirmed that your employer could approach Huntercombe Group with regard to any medical questions they might have. I know that you dispute that you ever gave oral permission but the fact remains that you provided written permission. Again this completely disregards the issue. The email in question is Email 23-07-2012 – I’ve edited this file to remove my former employers information. Ah yes an unemployed young man who’s been on benefits for three years can clearly afford taking legal action. Would may complaint have more sway if referred to by my MP? How is this fair? My MP is a total waste of space who has ignored me twice! The understatement of the decade! “Too often, public services regard complaints as a nuisance. They are nothing of the sort. How many reports dose it take before the PHSO admit they are evil! Patient Association report referenced in above article. If the PHSO was a sick animal, it would have been put down. I am very sorry to read of your concerns about our Office. is non-existent him doing his job in a professional manner would demonstrate his sincerity – but thats asking lot. I will arrange for one of my team to carefully consider the correspondence you have sent us, which you attached to the email. My letter was full of legal regarding the ‘powers’ of PHSO it needs to be reviewed by a lawyer! We will contact you again about this as soon as possible. We will look to do this within the next two to three weeks and will keep you updated. From the above we can concluded there was nothing for the PHSO to do. I got a response form Mr Jonathan Roper, to say this email was pointless, would be nice. I now have all the information I need to write to you. However, before doing this, I thought it appropriate to check if the points above have covered all your issues as I am keen to provide you with a full response. I will carefully consider its contents. I will provide my full written response to this letter and your previous one as soon as possible, but within the next two weeks. So no matter the question the “stock” answer from PHSO is Two Weeks. So 24th April 2015 he had everything, then on 29th April 2015 he needed more time. I’m at a loss to explain the constant and endless delays. Care Plan 25-04-2012 I was at Blackheath for a number of weeks. While at Blackheath they put my left foot into a plaster cast to straighten my foot. I want it noted I agreed with this, and it has helped. But the form giving them permission to do this, is incomplete. The two above medical errors have been reported to PHSO who have ignored it. In your case, The Huntercombe Group are an independent provider and therefore we can only look at complaints about services they were commissioned by the NHS to provide to you. As we understand things, the Huntercombe Group were an independent provider commissioned to give you NHS care and treatment. On that basis we could look at a complaint about the treatment they provided to you that was funded by the NHS. So I take from this as the NHS did not pay for my employer to break my privacy there is nothing the PHSO can/will do. Lets forget that my employer was the NHS. When contracting services to independent providers like Blackheath. Are they not bound by rules? 1.This document is a guide to required practice for those who work within or under contract to NHS organisations concerning confidentiality and patients’ consent to the use of their health records. It replaces previous guidance, HSG (96)18/LASSL (96) 5 – The Protection and Use of Patient Information and is a key component of emerging information governance arrangements for the NHS. 2. For the purposes of this document, the term ‘staff ’ is used as a convenience to refer to all those to whom this code of practice should apply. Whilst directed at NHS staff, the Code is also relevant to any one working in and around health. This includes private and voluntary sector staff. So The NHS wrote this document but it don’t apply. Lets also explore the fact that only because I was under the care of Blackheath could Dr Luff have written this letter. We are independent of both the NHS and government. We look at complaints fairly and do not take sides. We make decisions about whether we have seen mistakes, or if an organisation has acted correctly. That is a LIE! In Letter PHSO Letter 09-03-2015 The PHSO attempt to defend the actions of Blackheath compleatly ignoring other emails. We also try to resolve complaints quickly without the need to investigate, wherever possible. They (the PHSO) do everything in their power not to investigate – thats true, mainly it involves stressing the person making the complaint so much they give up. They lie and cheat. And misinterpret everything. We aim to do this within four weeks. We will update you regularly, and will let you know if we think it might take longer. Another LIE! I contacted the PHSO in November 2014 so far nothing! Also as far as keeping me informed, It’s due to my relentless chasing, emails and phone calls. On 26th May 2015 I sent complaint to Mrs Rachael Russell about Mr Jonathan Roper and his careless attempt to fob me off. Mrs Rachael Russell Said she would respond by 03rd June 2015 . Today is 08th June 2015 no response. One of our customer service staff will carry out these checks, and will contact you very shortly to introduce themselves. They will let you know what they will be doing and how long this will take. My definition of shortly is maybe 2 or 3 days – not 8 days. All my communication with the PHSO so far has been by letter! Mr Guy Kindly forward me the password (I use that term in the loosest possible way) and a PDF document. I’ve worked in IT for 15 years. Firstly PDF files can be cracked depending on strength of the password can determine the time it takes to do this.. a password of “Pacific01” is NOT secure in any sense of the word. www.passwordmeter.com gives this password a bit fat zero. In my complaint to Mrs Rachael Russell (To PHSO Letter 26-05-2015) We can quite clear identify unansewred questions. Mrs Rachael Russell has carrefuly avoided answering these. Make the PHSO completely unaccountable. They will LIE and support each other. They will be a major source of stress! They will appear as if on your side, but that will quickly be seen as a ploy. Join (phsothefacts.com) What really happens when you make a complaint to the Parliamentary and Health Service Ombudsman A true support group full of fantastic people. Warning some of the stories about the PHSO (and service they monitor) are truly shocking – You will be left asking how people at the PHSO sleep. On 1th June 2015 the PHSO said they would be in contact with me regarding the medical “errors” at Blackheath (See above)…so far nothing! Like all good NHS documents it agrees change is need, but provides no insight into the changes or how they could be accoumplished. Which has been used sooo much it’s lost all meaning. Its not exactly a “response”, more of a limp (pointless) agreement. This is a neurolinguistic tick. The word “voice” implies you have a voice and your concerns will be addressed. In my case I’m left with more questions after the PHSO did nothing. Again a fantastic statistics but the difference needs to be explained. so from 27,566 “Enquiries” only 854 were upheld. Not exactly something you want to scream about. This letter is funny and only serves to prove the PHSO are a total joke. You are looking for financial remedy to your complaint. Errr. We have never discussed the remedy i’m looking for. My first complaint I suffered a financial loss, so financial remedy is appropriate. They have correct identified my complaint (a miracle) however they contradict themselves…. We have carefully considered the information you have provided and have decided not to take further action on your complaint. I am afraid that we are unable to find evidence of any personal injustice arising from the events you complain of. You can’t find “evidence” because you never looked. In 2012 Lewisham Adult Safeguarding used records to show Blackheath did nothing wrong, who’s to say these records were not altered? It’s a fact that Blackheath have got many medical facts wrong. By doing nothing Blackheath are free to do this again.I was 1 of 3 people out of 18 patients that could talk.- My major concern is them doing this again. My experience at RHN was fantastic. At a time where everything was utter chaos the RHN gave me hope. Had i gone to Blackheath I don’t think my views on life would be so positive. Hah! DoH Just respoded to my FoI Request third_party_laws And as expected the PHSO lied! hConfidentiality – NHS Code of Practice Dose apply to third party providers. In response to questions, E, E1, E2, E3 and F. Firstly, yes the attached Confidentiality Code of Practice does apply to all providers of NHS care, whether they are NHS or non-NHS providers. It is a criminal offence to breach the Data Protection Act (1998) and doing so can result in imprisonment. The Human Rights Act (1998) also states that everyone has the right to have their private life respected. This includes the right to keep your health records confidential. If clinicians breach either the Data Protection Act (1998) or the Human Rights Act (1998), then it could potentially lead to a review of their fitness to practice. I Would argue PHSO doing nothing is also breaking the law and they are aware of an offense. The hypocrisy here is amazing. After speaking to the PHSO I had MORE question then when I started, when asked I was ignored! How can the PHSO be impartial and defend Blackheath? Second question! I asked the PHSO to quote the law they are using to refuse an investigation. They never did. I have just found in 2014 they talked to Blackheath! on that link we find Health & Social Care Data Flows: Information Governance – Preparing for Transition – What You Need to Know on page 8…. The HSCIC will shortly be publishing a Code of Practice on the management of confidential information in line with its obligations in the HSCA. The Code of Practice will outline the general principles for handling care records, including the need to maintain accurate records, to share them when appropriate, to inform citizens about the use of records, to hold records securely and to act within the law. You will be required to comply with the Code of Practice once it is issued. What they don’t they don’t tell you is these rules are not enforced! The ICO (who manage the DPA & FoI) don’t investigate individual complaints. The Confidentiality NHS Code of Practice is also not enforced. So once again the PHSO have published documents that on closer inspection fall apart. The answer (as you would expect) Is somewhat confusing. In all communication this report has been identified as NHS report, the PHSO’s answerer would suggest Mental Health & Ambulance Trusts are not part of the NHS. All complaints must be investigated thoroughly and any necessary action taken where failures have been identified. 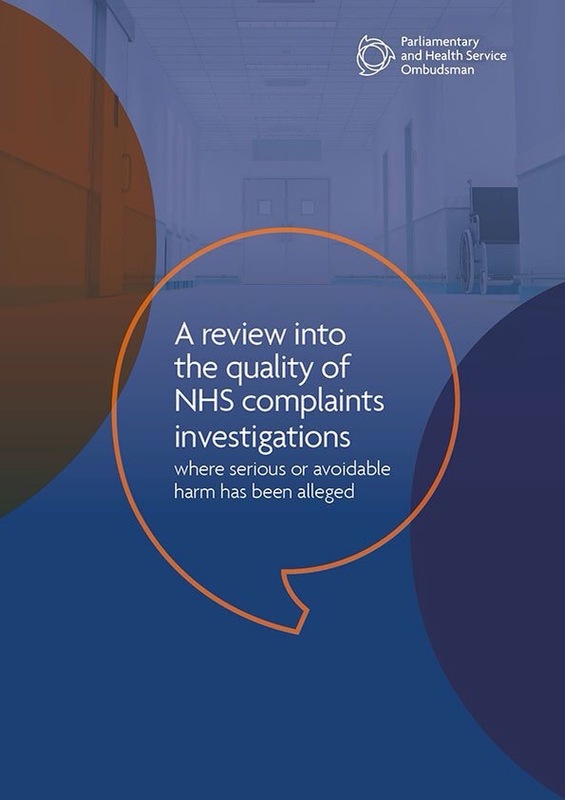 This suggest (to me) that while the CQC don’t investigate complaints, they do look at how the complaint was handled and will make sure “Lessons Learned” are implemented. So we have a serious question. Of the trust looked at by the PHSO, how many where rated good or better by CQC and WHY? Now the really question is… The CQC had published a report on complaints http://www.cqc.org.uk/sites/default/files/20141208_complaints_matter_report.pdf according to the document is was Published December 2014 so the question is…What has the PHSO been doing? Why waste public money re-doing research? This report paints a partial picture of the state of complaints in health and social care services, but one in which some things are clear. There is wide variation in the way complaints are handled and much more could be done to encourage an open culture where concerns are welcomed and learned from. While most providers have complaints processes in place, people’s experiences of the system are not consistently good. Each time the PHSO answer a FOI Request, I find it raises more questions than it answers! @PHSOmbudsman @XXXX @XXXX What are the top 5 reasons for not doing an investigation? Don’t make me do a FOI. Im not going to discuss the full file because it will just highlight how pointless the PHSO are. Please note that the information for 2015/16 is only provisional as we have yet to fully clean the data. Now these are the reasons for closing a case without investigation, it either falls into a category or it don’t. So what’s “clean data” mean? Secondly the data for 2015/16 is huge jump from 2014/15….i.e. There is no account or reason for this jump given. My feelings about the PHSO are not very well hidden. But todays publication of Service Charter is an insult to everyone who approched the PHSO. Lets for fun examine the claims made in the Service Charter. In my case I had to chase them almost daily, I’d never speak to the person doing the investigation. Following an open and fair process. The letter I got from the PHSO saying the don’t deal with employment issue is proof they don’t understand complaints. My complaint was a breach of date protection, yes my Dr did write to my employer but that was not my concern. They did not have permission to write any letter. evaluate the information, This I assume is code for ignore bits of your evidence we don’t like. Giving you a good service. As you can see My comments have been ignored.